Popular comedy show Bhabhi Ji Ghar Par Hai has recently landed into a controversy for promoting BJP-led Prime Minister Narendra Modi’s schemes during model code of conduct ahead of Lok Sabha polls. The show has taken the marketing strategy for elections to the next level. Not once by twice, the popular Tv show promoted PM Modi government schemes, in which the series character can be seen talking about Swach Bharat Abhiyan and other schemes by Prime Minister, Narendra Modi. This came to light after the user took to Twitter and posted a series of videos of Bhabhi Ji Ghar Par Hai. He shared Thursday’s episode and captioned, "Yesterday I realized Modi has found another venue to advertise himself. I watch "Bhabhi ji Ghar par hain" (that's right, deal with it), this TV serial has started to use some not so subtle Product placement/advertisement recently, but yesterday something else happened." In another Video tweet, the user shared a video of the same series Friday episode in which Ujjwala Scheme was promoted. The account also added, "Thursday's episode used Swacch Bharat Abhiyan while Friday's episode used Ujjwala Scheme to sing praises of Modi. Pay attention to keywords "humare desh ki akhandta aur ekta ko khatra na pahuche", & "karmath, sushil, gyani, atulniya, purush" used to set the tone." In another tweet, the user on the thread says, "This is a Textbook case of Paid promotion, blatant and shameless. And I don't believe for a second that the Writers for this show wrote this damn propaganda piece, this was provided to them by some agency like Modi's personal NGO/Propaganda company, A Billion Minds." This infuriated Tweeples with this and here are some of the comments on the viral thread. And that is THE issue. Ad without disclaimer has a greater impact in brainwashing people. Third class placement. Piss poor delivery. The canned laughter comes on as forced. Idk, people would be affected if they could sit thru all this cringe itfp. its illegality seems secondary to its worthlessness, imho. Bhabhi Ji Ghar Par Hai is a poular series produced by Benaifer Kohli and Sanjay Kohli under the banner of Edit II Productions. 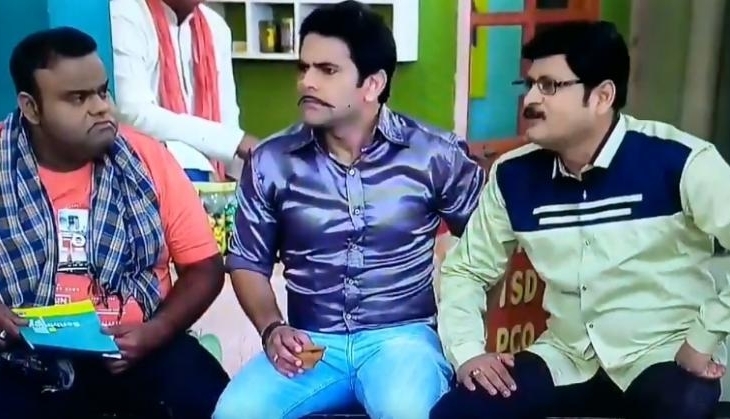 Year after it aired, the comedy show still roars on the TRP list.